YU Cattle Company is a thriving, family farming operation thanks to hard work and a commitment to sustainability. David Farren, CEO of Eau Claire Distillery, talks about his experience funding, growing, and excelling in his business creating whiskey in Alberta’s Turner Valley. The honey industry is a booming industry in Alberta; ATB’s FX platform helps honey co-op members navigate foreign exchange to get their honey into the hands of people all over. Need a new tractor? Combine crapped out? Should you lease or buy? Deciding whether to buy or lease new agricultural equipment can be difficult. Our Agricultural Experts are here to help make that decision simpler. If good weather, high prices and lots of hard work have given you some extra funds for the farm, what should you do with it? If you’re looking to sell your grain south of the border, understanding the rules and regulations can help you avoid run-ins with the IRS and hefty tax bills. Top of mind for many Canadians over the past year has been the uncertainty caused by the renegotiation of the North American Free Trade Agreement. You can now lay some of those fears to rest. 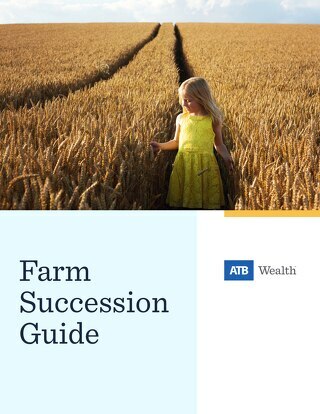 The final step in ensuring your farm's continued success after your retirement is the transfer of ownership to the successor.